Prediction markets like the Iowa Electronic Markets and InTrade allow people to place bets on election outcomes. They are far from perfect, but have been better at predicting election results than polls have been since their introduction. We gather national polls for the 1988 through 2004 U.S. Presidential elections and ask whether either the poll or a contemporaneous Iowa Electronic Markets vote-share market prediction is closer to the eventual outcome for the two-major-party vote split. We compare market predictions to 964 polls over the five Presidential elections since 1988. The market is closer to the eventual outcome 74% of the time. Further, the market significantly outperforms the polls in every election when forecasting more than 100 days in advance. According to both, Obama now has the biggest lead since the 2012 Presidential Election began trading. 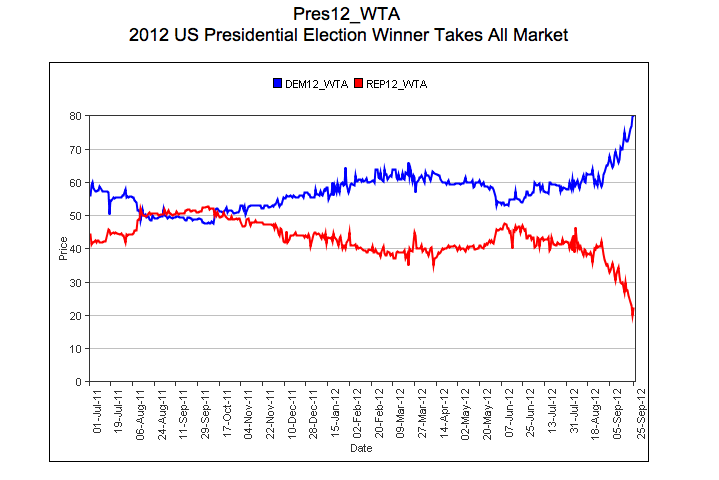 InTrade now puts the odds of an Obama re-election at just over 75%. The Iowa Electronic Markets put Obama’s odds slightly higher at just under 80%. Ha! Want to give an update on this one? Or perhaps it’s just better to pretend you never posted this. Obama’s chances certainly tanked after that first debate! But both prediction markets still think he is a 62/38 favorite. Also, Obama is leading in the electoral college according to the latest polls.